you have to push rear wheel toward the engine to let chain free a little bit and then grab the chain with your fingers and..
Also, it might be handy to get two friends, and have one of them stand over the bike and repeatedly sit down and stand up. After you see what's happening you can get your other pal to sit on it too and see what's happening. It's possible that your chain is adjusted just fine and this is really just a problem with the guard. Is there any adjustment you could do with the guard? No Maux, the guard can't be adjusted, I adjusted the chain but the sound still continues, it seems that the lower guard is designed this way by default to hold the chain in a triangular shape[I think]. The sound is killing me. It's not so horrible but I like a smooth bike. EDIT: when two people sit on the bike the chain moves up and it doesn't touch the lower guard anymore and the sound disappear. Last edited by exking; 04-10-2012 at 09:38 PM. 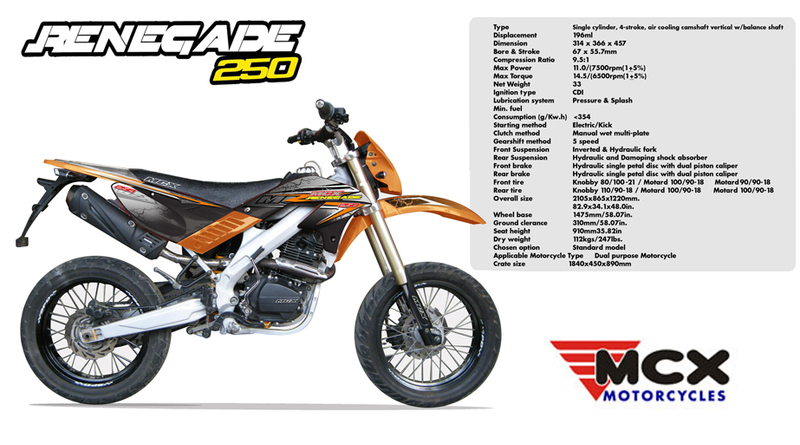 QingQi has recently announced their two new 250's. One in a half-faired street version called the QM25-2D and the other a 250cc version of our favorite 200cc super-mo. Both bikes use identical engines which look to be enlarged versions of the QingQi Suzuki DR200 derivative. Think it is 15.4kW so just a Typo, but still pretty impressive! Someone had one several years back if I recall correctly. You might want to join and ask on chinariders.net. I believe Haynes or Chilton covers the bike in one of their motorcycle books on Chinese bikes. Edit: The engine is near identical to the Suzuki DR200 so that should help you out as well.